We have had a couple of really awful trading days in the market! I am sure you noticed. And I probably shouldn't have bought that BMC stock. Not that BMC is a bad selection but I am going to give myself a new rule. When I get a stock sale on bad news AND a sale on good news on the same day, the bad news wins if I am able to make that decision. That is, I knew I had a sale on bad news....so why should I go ahead and listen to that other signal. TOO risky. O.K. that's money under the bridge. Or as we say in Wisconsin....that money is already out of the barn. You can see the first example of the interviews, with Covestor star Robert Freedland, here (pdf). "BobsAdvice" is trouncing the S&P, so it might well be worth paying attention to him. But boy, is that dense slug of text! We'd like an annotated version, please. Now that's a nice mention. It's a busy day for me and I have to run. But take a look at the article if you get a chance and visit Covestor. Let me know if you need an invitation for a membership there as I have four more. One of you got one of my invites. I hope it is working out well for you. I love the place! BMC Software (BMC) "Trading Transparency"
Earlier today I wrote about how I sold a portion of my Harris (HRS) at a gain giving me the "permission slip" to add a new position. So I had a nickel in my pocket waiting to be spent! Now I know you are going to point out how the Dow is plunging (as I write it is down 360.92 points or a (2.64)% drop), and how the NASDAQ is also dropping (as I write it is down 76.42 points for a (2.70)% decline). But a nickel is a nickel. And in almost every market there are stocks that are moving higher for a reason. Anyhow, that's my excuse :). Frankly, I just don't have any self-control! BMC Software (BMC) was making the list of top % gainers on the NYSE. Of course, now it too is not as strong as earlier, and now, just before the close is trading at $34.12, up $.44 or 1.31% on the day. I went ahead and purchased 210 shares of BMC for my Trading account at $34.38. I probably should have sat on my hands :). Very briefly, yesterday after the close of trading BMC announced 2nd quarter 2008 results. Earnings for the quarter came in at $78 million or $.39/diluted share, ahead of last year's $58 million or $.28/share last year. Non-GAAP earnings, taking out special one-time items, were even higher. Revenue for the quarter came in at $421 million, up 9% over last year's results. More importantly perhaps, the company beat expectations. And they also raised guidance. These are all important factors and it is rather impressive that BMC was able to advance at all in such a broad correction as we experienced today. Longer-term, the Morningstar.com "5-Yr Restated" financials on BMC look strong with especially impressive revenue growth the past four years, increasing earnings, and actually decreasing outstanding shares. Free cash flow is solidly positive and balance sheet appears strong. 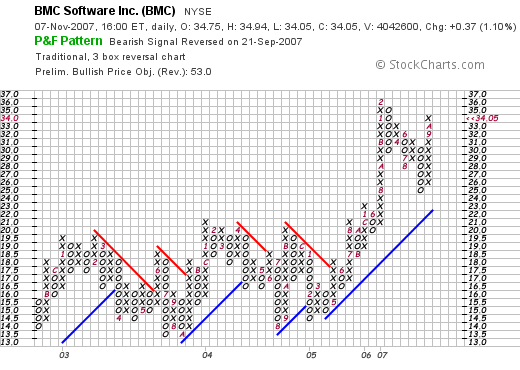 Finally, the "point & figure" chart on BMC from StockCharts.com appears reasonably strong without appearing over-extended. So maybe I shouldn't have bought anything today. But then again, just like when I sell a stock I don't really feel like selling when everything is moving higher, if I have a signal to buy, well, I guess I should be buying when I have a signal. And BMC seemed to fit the bill. Wish me luck! Thanks again for dropping by! If you have any comments or questions, please feel free to leave them on the blog or email me at bobsadviceforstocks@lycos.com. If you get a chance, be sure and drop by my Covestor Page or visit my SocialPicks Page where all of my picks are reviewed! Harris (HRS) and U.S. Global Investors (GROW) "Trading Transparency"
Hello Frineds! Thanks so much for stopping by and visiting my blog, Stock Picks Bob's Advice! As always, please remember that I am an amateur investor, so please remember to consult with your professional investment advisers prior to making any investment decisions based on information on this website. Earlier today I made two trades in my Trading Account that I wanted to keep you updated on. Both of these trades are examples of my investment strategy that defines my portfolio management approach. First trade was Harris Corporation (HRS), which hit a sale point on appreciation yesterday to a 30% appreciation level. As you may recall, I have targeted appreciation levels which are set at 30, 60, 90, 120, then 180, 240, 300, 360, and 450%, etc. When a stock hits these levels, I sell 1/7th of my holding and use this sale on 'good news' as a signal to add a new position (assuming I am not already at my maximum 20 position portfolio size). I sold 17 shares of HRS, representing 1/7th of 120 shares of the stock, earlier today at $65.81. My shares in Harris Corporation were originally purchased 1/31/07, at a cost basis of $50.05. Thus, at $65.81, this represented a gain of $15.76 or 31.5% since my original purchase. Since I am under 20 positions, this entitled me or gave me a "permission slip" to add a new position. When would I sell Harris (HRS) next? Well, being optimistic, if the stock should rise to a 60% appreciation level or 1.60 x $50.05 = $80.08, then I would be selling 1/7th of my 103 shares or 16 shares at that level. On the downside, after a single sale at a 30% appreciation level (much like what happened with my WWW shares), if the stock should decline to break-even, then ALL remaining shares are sold. The other sale today was my sale of my shares of U.S. Global Investors (GROW). In this particular case, I sold ALL of my shares which worked out to a sale of 245 shares at $19.7101. These shares had been purchased recently, in fact they were purchased 10/10/07 at a cost basis of $21.27. Thus, I had a loss of $(1.56) or (7.3)% since purchase. I initiated the sale when the stock was at a loss of (8)%. I have reduced my rating on GROW to "hold" because nothing fundamental has changed. However, my own sale was due to a technical price change and nothing fundamental that I have determined. The question arises is what I should do with the proceeds of these two sales. My sale of HRS entitles me to buy a new position, and my sale of GROW requires me to 'sit on my hands' with the proceeds. I shall be doing both. That is, I shall look for a new position based on my HRS sale. However, I shall not be replacing my GROW position with a new position. I hope that makes sense :). Thanks so much for stopping by and visiting my blog! If you have any comments or questions, please feel free to leave them on the blog or email me at bobsadviceforstocks@lycos.com. If you get a chance, be sure and visit my podcast website (I shall need to get a new program up ASAP), consider visiting my Covestor page where all of my trades and my trading portfolio performance is evaluated and monitored, and my Social Picks page where all of my stock picks since the beginning of the year are recorded and also monitored. K-Tron (KTII) "A reader suggests a stock pick!" I have the good fortune of having a bunch of great readers of my blog who also are often the source of terrific ideas. After having explained what I think makes a great stock, they are quick to bring some of the best ideas on this website to my attention. "Fwd: K-Tron Reports Best Third Quarter and First Nine Months in its History, with Record Revenues, Net Income and Earnings Per Share in Both Periods" He commented: "This might hit your % gainers list today!" Well Doug it did! In fact K-Tron closed at $118, up $10.00 or 9.26% on the day, making the top % gainers list on the NASDAQ! I do not own any shares or have any options on this stock. I do not know if Doug has a position or not at this time. Let me briefly review some of the things that brought Doug to this decision and why I agree that this stock belongs on my blog. As Doug pointed out, K-Tron (KTII) reported 3rd quarter 2007 results after the close of trading yesterday. Net income for the quarter was $4.93 million, up 80.1% from the $2.74 million reported in the same period last year. Revenues for the period climbed 38.1% to $48.17 million from $34.9 million last year. Longer-term, the Morningstar.com "5-Yr Restated" financials is solid, with steady revenue growth, steady earnings growth, and a stable number of shares (only 3 million). Free cash flow has been positive and growing and the balance sheet is solid. Looking at Yahoo "Key Statistics" we see that this is a small cap company with a market cap of only $318.01 million. The trailing p/e is a reasonabvle 19.33, Price/Sales is 1.68, and Price/Book is 3.68. There are 2.7 million shares outstanding with only 1.84 million that float. As of 10/10/07, there were 5,180 shares out short representing 1.3 trading days of volume, not a very significant level imho. No dividend is paid and no stock splits are reported. 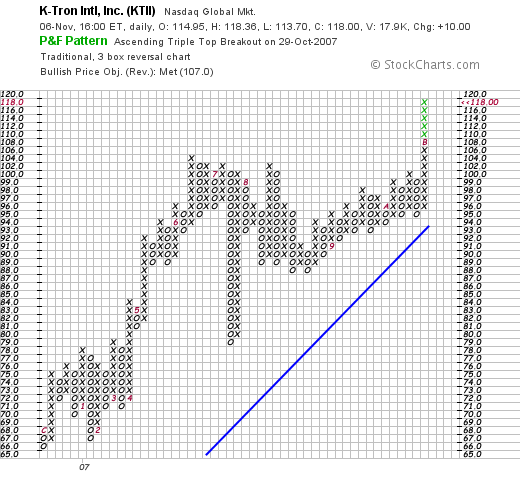 Finally, looking at the 'point & figure' chart on KTII from StockCharts.com, we can see a fairly healthy appreciation of the stock price except for a sharp dip in July, 2007, when the stock fell from $102 to a low of $79. Recently, the stock has moved into new high territory closing today at $118. In summary, I think that Doug has once again brought a great stock to my attention. Thank you Doug! The company had a terrific quarterly report, their Morningstar.com page is great and the chart looks just fine. On the downside, there are less than 3 million shares outstanding. This adds to the volatility but if they continue to report strong results, this is likely to be on the upside. Thanks again for stopping by and visiting! With a special 'thank-you' to Doug for writing and suggesting this stock. If you have any comments or questions, please feel free to leave them on the blog or email me at bobsadviceforstocks@lycos.com. Hologic (HOLX) is an old favorite of mine. I last reviewed the stock on July 25, 2006. I have been an owner of shares in the past and my stock club has also owned shares at times. 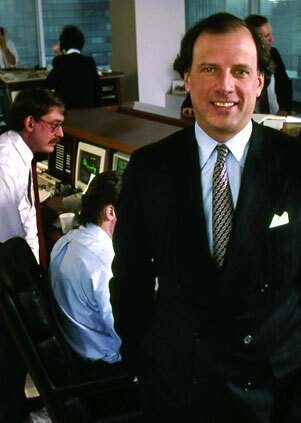 In fact, Hologic was the purchaser of Cytyc (CYTC) a stock that was a terrific performer. Cytyc went higher and HOLX the other way leading to a sale as I recall the sequence of events. Today, just prior to the opening of trading, Hologic announced 4th quarter 2007 results for the quarter ended September 29, 2007. Revenue for the quarter came in at $202.5 million, a 31% increase compared to the $154.1 million in the same quarter last year. Net income was even nicer, coming in at $32.1 million or $.58/share, compared to a net loss of $(1.5) million or $(.03)/share. The company beat expectations of $.53/share and revenue figures of $198.8 million. However, what did the street do to the stock? In the usual over-reaction of buying on expectations and selling on the news, the street took Hologic stock apart. The stock traded as low as $59.45 today, down almost $8 from yesterday's close near $67. With the apparently irrational move, I chose to break all of my rules and bought and sold 400 shares of HOLX today. I purchased 400 shares of HOLX at $62.9799 earlier today, and then later today with the stock moving higher, sold my 400 shares at $63.97. I guess I made my point. I do not own any shares of HOLX as I write. The trade is done. Anyhow, that's the update! If you have any comments or questions, please feel free to leave them on the blog or email me at bobsadviceforstocks@lycos.com. Wolverine World Wide (WWW) "Trading Transparency"
As part of this weblog, I like to keep my readers informed of any actual trades in my trading account. (You can also visit my Covestor Page where my trades are regularly updated.) A little earlier this morning I sold my 200 shares of Wolverine World Wide (WWW) at a price of $23.43. My shares of WWW were purchased last year on 4/19/06 at a cost basis of $23.55. Thus, I had a loss of $(.12)/share or (.5)% since purchase. This sale was triggered by the stock passing a 'break-even' level. Previously, on 1/31/07, I sold 40 shares of my original 240 share position when the stock was at $30.57 which represented a 1/6th sale (I am now at 1/7th sales), at a gain of $7.02 or 29.8%. This is part of my strategy of selling at a 30% gain a portion of my holding. As part of my strategy, after a single partial sale at the first sale point of 30%, I move my acceptable loss from (8)% to break-even. And this is exactly what happened to Wolverine World Wide (WWW). Since I am selling my own shares of Wolverine World Wide, even though it is on what I would call a 'technical' basis, I shall be reducing my rating on the stock. I say 'hold' instead of 'sell' not because I am speaking in some sort of code, but rather because the Morningstar.com '5-Yr Restated' financials on WWW are still intact, and the latest quarterly report was strong and beat expectations, and the company raised guidance. With this sale on 'bad news', I am now down to 14 positions and 'sitting on my hands' with the proceeds' That is, my idiosyncratic system requires me to avoid reinvesting funds received from sales on losses. My system is telling me that the market is weak (do I need a system to tell me THAT? ), and I am waiting for a sale on a gain as a signal to do some buying! Thanks again for dropping by and visiting! If you have any comments or questions, please feel free to leave them on the blog or email me at bobsadviceforstocks@lycos.com. If you get a chance, stop by and visit my Podcast Website where I have several 'shows' available discussing stocks from my blog and portfolio, my SocialPicks Page where all of my picks from the last year are assessed and my performance analyzed, and my Covestor Page where Covestor is reviewing the performance of my actual trading portfolio! Have a great day regardless of the direction of the Dow! About once a month or so I have been trying to share with you an updated status report on my Trading Portfolio. Most of this is really unnecessary as my participation on Covestor can give you most of the same data. However, Covestor does not provide actual #'s of shares held but rather the composition of the portfolio by %'s. Also, I have been dealing with margin debt in my account and my long-term goal is to eliminate this debt and that kind of information is also not part of Covestor. Besides, while I do want to have you visit Covestor and check out some of the other portfolios on that website, I do not want to require you now to visit another page to get the information I was providing here previously. O.K., enough of that. Let's get down to the actual account. Like before, I will list my 15 holdings alphabetically, followed by symbol, number of shares owned, date of purchase, price of purchase, latest price (11/2/07), and percentage unrealized gain (or loss). Currently I am at 15 positions, with 20 being my maximum and 5 being my minimum number of holdings. The equity value is $108,391.74, with $(48,854.92) in margin with a total account value of $59,536.82. My margin equity % has dipped to 54.92% from last month's 57.11%. As of 11/3/07, I had $25,346.62 in unrealized gains in the account. Since the beginning of this year, I have taken a net of $(630.70) in net short-term gains and $30,885.69 in realized net long-term gains for a total of $30,254.99 in realized gains. The account has had total income of $380.50 and I have paid a total of $(4,171.02) in margin interest. Except for my own use of equity funds (drawing off $5,000 this past month for expenses), the account has maintained a solid performance for the year. Let's see if we can get through the last couple of months of this year with this performance intact! Thanks so much for stopping by and visiting my blog! If you have any comments or questions, please feel free to leave them on the blog or email me at bobsadviceforstocks@lycos.com. If you are interested, be sure and visit my Covestor page where you can monitor my trading portfolio performance and trades on a frequently updated basis. In addition, visit my Stock Podcast website where I discuss some of the stocks I own as well as just write about on the blog. To see how the blog is performing overall, visit my SocialPicks page which analyzes all of my stock picks for the past year. U.S. Global Investors (GROW) "Weekend Trading Portfolio Analysis"
It has been several weeks since I last discussed an actual holding of mine on this blog. In fact, almost a month has passed since I reviewed Covance (CVD) on this blog. Going alphabetically (by symbol) through my list of 15 holdings, I am now up to U.S. Global Investors (GROW). Let's take a closer look at GROW and I will show you why it still makes sense for my portfolio and whether it still represents an "investable" company. Currently I own 245 shares of U.S. 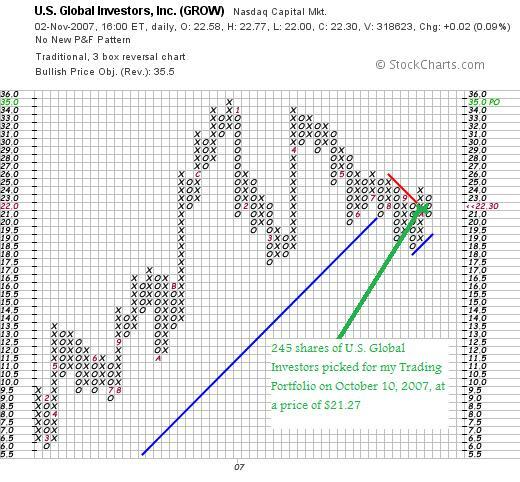 Global Investors (GROW) that were purchased October 10, 2007, at a cost basis of $21.27. GROW closed 11/2/07 at a price of $22.30, giving me an unrealized gain of $1.03 or 4.8% since my purchase. When would I sell the stock next? Assuming the stock continued to appreciate in price, my first targeted sale on the upside is at a 30% appreciation point. For GROW and my purchase, this represents a price of 1.30 x $21.27 = $27.65. At that point I would plan on selling 1/7th or 245/7 = 35 shares. If the stock should decline sufficiently, I shall sell all of my shares. Since I haven't sold the stock yet at a gain, the price on the downside remains at an 8% loss limit, or .92 x $21.27 = $19.57. "...through its wholly owned subsidiaries, provides mutual fund management services. It provides investment advisory services to institutions and individuals; transfer agency and record keeping services; mailing services; and distribution services to mutual funds advised by the company. The company primarily invests in early-stage or start-up businesses." On September 12, 2007, GROW announced 4th quarter 2007 results. Revenue for the quarter ended June 30, 2007, came in at $21.83 million up from $18.96 million the prior year. Net income was reported at $6.41 million or $.41/share, up from $5.62 million or $.37/diluted share the prior year. Assets under management increased 33.9% from the prior year to $4.61 billion from $3.44 billion the prior year same period. In another vote of confidence for the stock, GROW doubled the monthly dividend to $.02/share from $.01/share. Reviewing the Morningstar.com "5-Yr Restated" financials on GROW, we find that revenue has dramatically increased from $7.5 million in 2003 to $58.6 million in 2007. Earnings have also increased from $0 in 2003 to $.20/share in 2004, dipped to $.10/share in 2005, then rebounded to $.70/share in 2006 and $.90/share in 2007. Meanwhile, shares have been stable at 15 million since 2003. The company does pay a dividend which is listed at $.30/share in the trailing twelve months (TTM). Free cash flow has also grown from $1 million in 2005 to $5 million in 2006 and $8 million in 2007. The balance sheet appears solid with $15 million in cash, which by itself could easily pay off the current liabilities of $8.7 million. No long-term liabilities are reported. In addition, the company has another $22 million in other current assets. 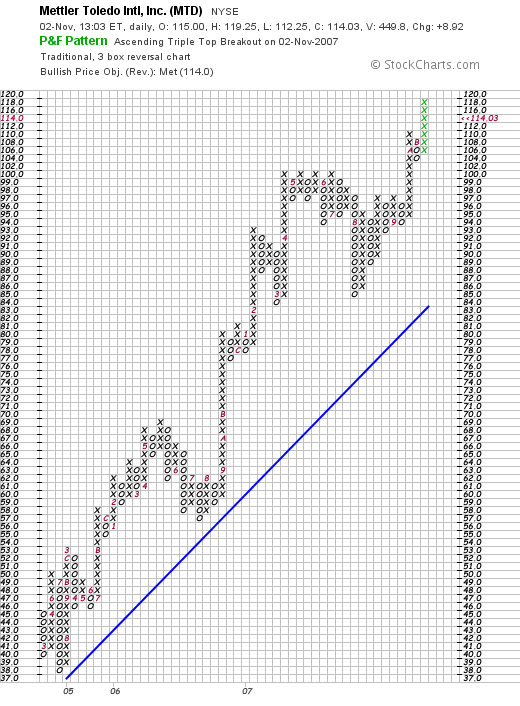 Taking a look at the "point & figure" chart on GROW from StockCharts.com, we can see that the stock has had a strong run from the $6.00 range in March, 2006, to a high at $35 in December, 2006. Unfortunately, the stock has not exceeded that high, even after a strong run in April, 2007. Currently, the stock has broken through the main support line at $21 in July, 2007, and is struggling to find new support to move higher. I am not prepared to sell the stock at this time and am awaiting the soon to be announced earnings for the first quarter of fiscal 2008. The earnings reported last quarter were strong, the Morningstar.com report was strong, but the chart doesn't inspire me to think too confidently about this stock. Thus the "hold" rating. Thanks for stopping by and visiting my blog! If you get a chance, be sure and visit my Stock Picks Podcast Page, my Covestor Page, and my SocialPicks Page. The Podcast is a companion to my blog, the Covestor site is useful as an analysis of my actual Trading Portfolio (including this stock) and my SocialPicks page is a general overview of all of my stock picks the past year. This is usually the place I review stock picks. But I didn't pick any stocks during the week of May 8, 2006. I could, I suppose, skip a week ahead. But when given the opportunity to skip anything, well you know how that goes :). It is a great autumn day to get outside and appreciate the beautiful colors of nature. This is a photo I found of Wiesbaden, Germany. Have a great weekend everyone! I shall try to get another post up later today or tomorrow! 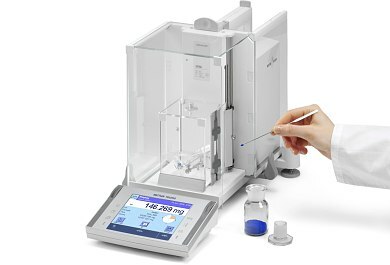 Mettler Toledo International (MTD) and an article about Martin Zweig! The stock market sure has been volatile the past few days. I cannot tell you how many times I felt like selling a position just because it didn't 'feel right'. Fortunately I have a very well-defined strategy of buying and selling stocks and can depend on it to keep me from making a quick move that I might regret later. I found an interesting article about Martin Zweig that caught my eye today. In his analysis of individual stocks, Zweig is first and foremost concerned with the company's earnings. "I don't get that much involved in the product being produced," he wrote in Winning on Wall Street. "If a company can show nice consistent earnings for four or five years, I don't care if it makes broomsticks or computer parts." Unlike many investors, however, Zweig doesn't simply look at earnings growth over one fixed period; instead, he dissects a company's earnings from a variety of different angles, trying to find firms that have shown steady and "reasonable" long-term growth that has been accelerating in recent quarters. I've broken his earnings analysis down into two main categories below. Long-term earnings: These criteria include long-term earnings per share growth and "earnings persistence". To show sufficient long-term growth, a company must have increased its EPS by an average of 15 percent per year, with long-term growth of 30 percent or more the best case. To show "earnings persistence", meanwhile, it must have increased its EPS in every year for a five-year period. Recent earnings: Zweig wants the current quarter's earnings to be positive, and wants the current quarter growth (over the same quarter last year) to be positive. But he doesn't just want to see growth; he also wants the rate of growth to be accelerating. He doesn't want to jump on the train too late, after earnings growth has peaked." I believe that Mr. Zweig is right on the money about investing. At least that is my own philosophy as well. I don't think there is anything magical about picking stocks for a portfolio. It is important to narrow down your universe of acceptable stocks (what I call my "vocabulary of stocks") and have some sort of system that assists you in determining when you should be buying and when you should be selling. Like many investors, Zweig also focuses on the P/E ratio. But unlike most others, he doesn't just target stocks with low P/E figures. In fact, to Zweig there is such a thing as a P/E that is too low. His reasoning: a very low P/E may be very low for a reason -- that the company is weak and doesn't have the ability or potential to command higher share prices from investors. The model I base on his approach thus requires stocks to have P/Es greater than 5, to protect against such weak companies. Because he targets companies with steady and reasonable growth -- the type of companies that aren't likely to go unnoticed on Wall Street -- Zweig is willing to buy stocks with above-average P/E ratios. Still, there is a point at which price can get too high relative to earnings for him, and the model I base on his writings sets that upper limit at three times the market average. As a way to make sure that the market itself isn't too overpriced, this model also sets an absolute limit of 43 for a company's P/E ratio. Currently, the market P/E is 19.0. Aeropostale, meanwhile, has a P/E of 13.2, based on trailing 12-month earnings, passing this test. It's important to note that, while Zweig focuses a good deal on earnings, he acknowledges that earnings sometimes don't tell the whole story. In order to keep growing over the long-term, Zweig believes that earnings must be accompanied by a comparable or better increase in sales; cost-cutting measures are fine, but by themselves they can't sustain good growth over the long haul." "Another factor that can make good earnings misleading, Zweig says, is debt. A lot of debt means a company has significant fixed interest payments, and if business slows, those payments can whittle away profits. Zweig makes a very smart point here: that debt levels vary by industry. The model I base on his approach thus makes sure that a company's debt/equity ratio is less than its industry average. In this regard Aeropostale excels: While other retail apparel firms average 48.95 percent debt/equity ratios, Aeropostale has no debt. One final Zweig-based category: insider transactions. Zweig believes that those who work for a company know the business best. If a lot of them are selling their shares, and no one buying shares, it could mean trouble; conversely, if a lot of them are buying, but no one selling, it could bode well." Finally Zweig also knew when it was important to sell a stock. He set limits on his purchases. "One final key part of Zweig's approach is his belief in stop-losses, which I don't include in my model. Essentially, Zweig set downside limits on his investments, and if the stock ever fell to these levels, it was automatically sold, as a means to limit losses." Does all of this sound familiar? I do not claim to be in the same league as a Martin Zweig. But we can all learn from the best investors out there. I hope you enjoyed the comments. I was looking through the list of top % gainers on the NYSE today and came across Mettler Toledo (MTD). Mettler Toledo closed today at $112.52, up $7.41 or 7.05% on the day. I do not own any shares of this stock nor do I have any options. "...supplies precision instruments and services worldwide. It offers various laboratory and industrial instruments, and retail weighing instruments for use in laboratory, industrial, and food retailing applications." Much like a 'broken-record', I shall explain that the company made a big move higher today after a strong earnings report after the close of trading yesterday! On November 1st, the company announced 3rd quarter 2007 results. For the quarter ended September 30, 2007, sales growth was 7% in 'local currency' with sales coming in at $442.6 million, up from 4397.3 million. GAAP earnings were flat at $1.16/share in both 2007 and 2006, but adjusting for 'one-time items', adjusted EPS in 2007 was $1.15, up 24% over the prior year amount of $.93/share. The company beat expectations of $1.06/share for the quarter. If we review the "5-Yr Restated" financials on MTD from Morningstar.com, we can see that first of all the company has been consistently growing its revenue from $1.2 billion in 2002 to $1.6 billion in 2006 and $1.7 billion in the trailing twelve months (TTM). Earnings during this period did dip from $2.20/share to $2.10/share between 2002 and 2003, then since then have steadily increased to $3.90/share in 2006 and $4.30/share in the TTM. No dividend is reported, but the outstanding shares were even better than stable, they actually were decreased from 44 million in 2002 to 42 million in 2005 and 40 million in 2006 and 2007. Free cash flow has been solidly positive and growing the past several years with $138 million in 2004, $145 million in 2005, $157 million in 2006 and $173 million in the TTM. Meanwhile, the balance sheet appears solid with $100 million in cash and $533 million in other current assets. This total of $633 million in current assets, when compared to the $378.7 million in current liabilities yields a current ratio of 1.67. The company also has a moderate amount of long-term liabilities listed at $588 million. Yahoo "Key Statistics" on Mettler Toledo are helpful in providing us with some valution numbers. With a market capitalization of $4.18 billion, MTD should be considered a large mid-cap stock! The trailing p/e is a moderate 25.98 with a forward p/e of 22.73 (fye 31-Dec-08). The PEG works out to a bit rich at 1.85. Valuation-wise, from the Fidelity.com eresearch website, we can see that the Price/Sales (TTM) ratio is a very reasonable 2.39, compared to the industry average of 4.10. The company is also quite profitable compared to its peers with a Return on Equity (TTM) of 27.91% compared to the industry average of 8.01%. Finishing up with Yahoo, there are 37.18 million shares outstanding with 32.2 million that float. As of 9/25/07, there were 84,560 shares out short, not representing much of a short interest, with 0.5 trading days of volume (the short ratio). No dividend is paid and no stock split is reported on Yahoo. Examining the "point & figure" chart on Mettler Toledo (MTD) from StockCharts.com, we can see what I would have to call a gorgeous picture of stock price appreciation with a rather steady rise in price from a low of $38 in July, 2004, to a recent high near $116. Needless to say I like this stock a lot! This is my kind of company with persistence of earnings, persistence of revenue growth, increasing free cash flow, a slightly decreasing outstanding shares, and a solid balance sheet. With the great technical chart, what is there not to like? I am not in a position to be buying any shares of anything, so I shall be keeping this stock in my 'vocabulary' of investable stocks. Thanks again for stopping by! If you have any comments or questions, please feel free to leave them on the blog or email me at bobsadviceforstocks@lycos.com. If you get a chance, be sure and visit my Covestor Page where my Trading Portfolio is analyzed, my SocialPicks page where my stock picks are evaluated, and my Stock Picks Podcast website, where I discuss many of these same stocks I write about on the blog!